The Israelites had several different festivals – each celebrating different things. The Festival of the Booths sounds like quite an adventure. They would all go live in tents for a week as a reminder of the time all of the Israelites wandered in the wilderness. The Year of the Jubilee was especially interesting. Every 50 years, they were supposed to take a whole year off – that sounds like a great idea. The land was supposed to lie fallow as well so it got a year off. The Year of Jubilee was about redemption. Slave and servants were set free, property that had been sold was given back to the original owner, houses were given back and inheritances restored. 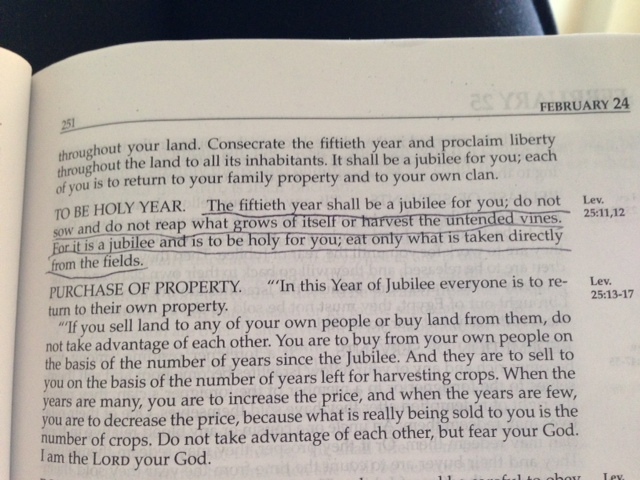 Does it surprise anyone that there is no historical evidence that the Year of Jubilee was ever observed? I’m not surprised. Not at all. Most of us are just too self-centered and greedy for that. Many of us have trouble giving away stuff out in our garage that we haven’t used for 10 years. Give back the stuff, the garage AND the house? That’s not happening this side of heaven. But maybe one step towards celebrating some sort of Jubilee is if we can soften our hold on ‘things’ and give more away. Give it away so other people can actually use it. Clean out our closets and make some room for our cars in our garages. Let’s all call THIS the Year of Jubilee and start giving away the things that we’ve been piling up because we think we might need them ‘some day’. Let’s celebrate as other people get to benefit from our generosity. Dear Father, Please help us loosen our hold on our ‘stuff’ so that this can be a year of increased freedom for us – our Jubilee. I had a real hard time reading these passages because it seemed that they were saying the same thing time and again. Since we dont have to sacrifice in these ways it seemed “unimportant”. They had to put a lot of thought and understanding into the right way to sacrifice. Since these rules aren’t necessary for us, we may never know the full meaning of sacrifice. When we sin we don’t have to find our best unblemished male, and maybe we should have to spend a week in a tent in rememberance of all the things God affords us that we are never fully greatful for. After reading your thoughts I went back to see the things I missed the first time. Thanks for pointing this out. I agree with you – these books are not easy reading. One of my favorite things about the chronological Bible is that they put all of these difficult parts together so we only read them once instead of several times throughout several different books. Since we don’t do the tent thing 🙂 we are challenged to develop our own ways of remembering to be thankful to God. One of the things I’ve started to do is to thank God for his faithfulness whenever I see the sun rising yet again in the morning. It is because of God that we are able to live and move and breathe. Thank you, God! It definitely takes additional thinking and diving to find the nuggets in some parts of the Old Testament – but it’s worth it! Thanks for the comment!